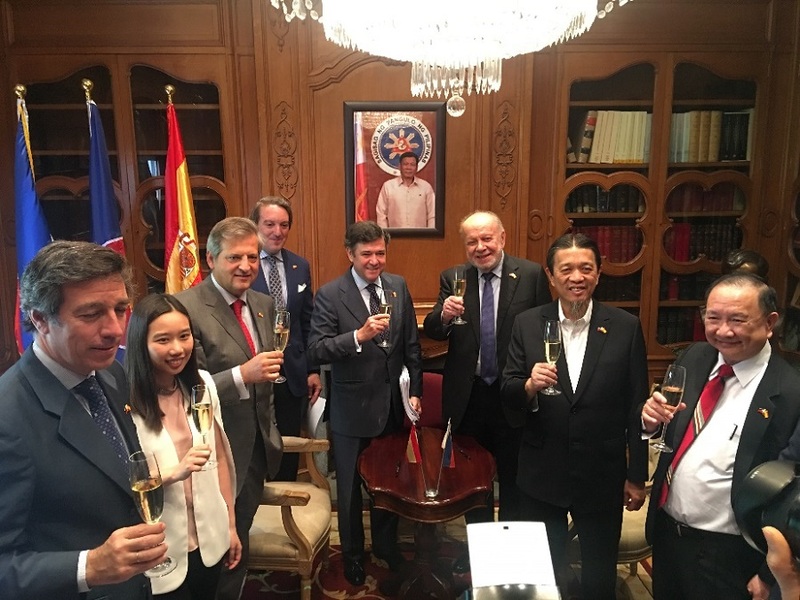 Ambassador Philippe J. Lhuillier witnessed the signing of the agreement between Filipino entrepreneur Lucio Co and Jesús Medina García de Polavieja, CEO of Williams & Humbert Wineries, on 28 May 2018, at the Philippine Embassy in Madrid. 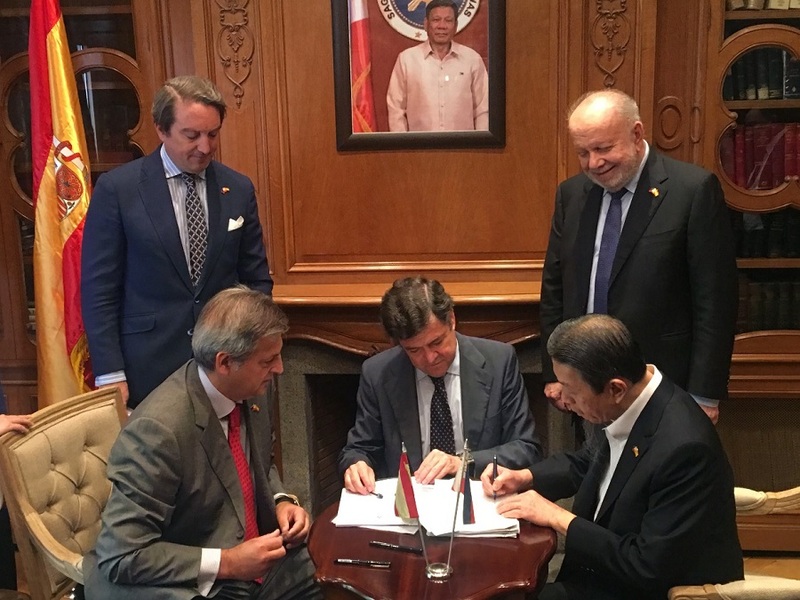 During the signing, the Ambassador expressed the Embassy´s support to mutual trade and economic endeavors between the Philippines and Spain and encouraged other companies to explore various opportunities, both in the Philippines and in Spain. He said that the dynamic exchanges between the two countries will be beneficial not only to individual companies but also to Philippine-Spanish relations in general. Ambassador Lhuillier further stressed the Philippines´ positive business environment and policies which the Spanish companies could take advantage of. He congratulated Mr. Lucio Co who has become a shareholder of Williams & Humbert Wineries by acquiring a significant stake in the Jerez winery owned by the Medina family. This investment will allow the company to strengthen its existing business and put it in a position to pursue future expansion. Jerez-based winery Williams & Humbert has one of the longest histories and traditions in making Sherry wine and brandy with the Jerez/Xeres/Sherry Designation of Origin, as well as other fine spirits and products in the food industry. It has over 30 proprietary brands marketed in over 70 countries. In 1995, the Medina family acquired a stake in the firm, founded in 1877 by Alexander Williams and Arthur Humbert, which they gradually increased until they owned 100% of its share capital in 2013. According to the Spanish company, the entry of Mr. Co as a shareholder of the firm, will boost the company´s strategic plan by consolidating its brands´ position and opening up the possibility of future investments by the winery. Lucio Co is one of the most dynamic entrepreneurs in the Philippines today, and among the world´s largest buyers of brandy, wines and spirits from the Sherry Triangle region, which has earned him the recognition of the Town Council of Jerez and of the Brandy de Jerez Designation of Origin Regulatory Council. COSCO Capital, founded and chaired by Co, is a publicly traded holding company (PSE: COSCO) with diverse business interests covering the retail sector, as well as distribution of fast-moving consumer goods, energy and real estate. Co’s Puregold Price Club (PSE: PGOLD) is the Philippines’ largest supermarket chain. The signing was also witnessed by a delegation from Manila headed by Mr. Lucio Co, officials of Williams & Humbert Wineries, and Madrid PE´s Deputy Chief of Mission and Consul General Emmanuel R. Fernandez.